Process / Usage / Advantages – Getting started with Outfy! Outfy app is a facilitator tool that helps save you loads of time by posting on your social media accounts, as per your chosen settings. You can choose to post in real time or even schedule for the future. 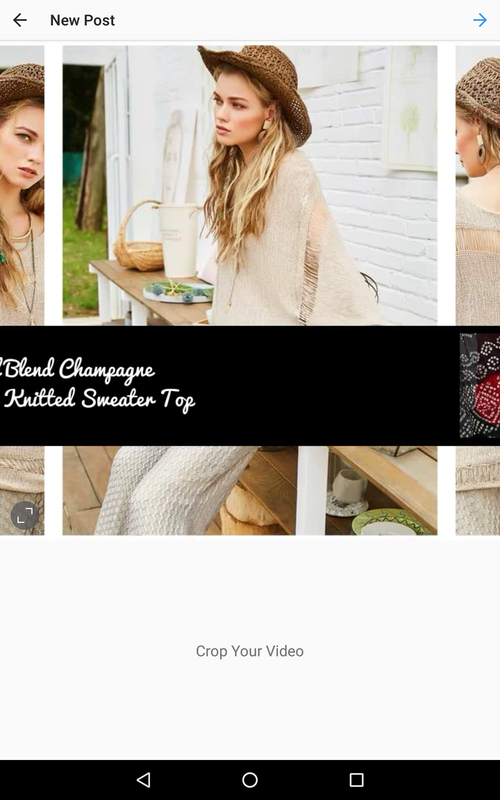 You can create Collages, Animated Gifs and Videos from your product pictures and post them to social media. You can automate these as well. How is Outfy different from other tools / apps available? What is Outfy’s USP? Why should I share my products to social media and social e-commerce sites? Social is the future of retail. Social media and social e-commerce websites have taken a huge leap in the last couple of years. Users are now making their purchasing choices socially and they even maintain a list of the all the things they like and discover newer products through these websites. Moreover most of these social networks are free for retailers like yourself, and you can leverage the reach of these sites for your products. Can I share the posts instantly through Outfy? How much into the future can products be scheduled? You can schedule your posts for the future also – for as long into the future as you wish, we don’t set any limits for you @Outfy! I have registered at Outfy, and connected my online shop. Is there a checklist that I can refer to before I start posting through Outfy? I forgot my login password, how do I recover same? How do I login to Outfy mobile app? I want to edit / cancel the posts I scheduled earlier. How can I do that? I added new products to my store. How will these be synced to my Outfy account? Can I only promote products with Outfy? What if I want to promote my whole collection? Who all will see my promotions done through Outfy? I am unable to find an answer to my problem here. What should I do now? How much does it cost me to promote through Outfy? Outfy tool is for you to use as per your requirement / marketing budget / promotion plan. Your credits get deducted only when you promote / share your products on the social media. Each share = 1 credit point. There is no minimal monthly commitment or monthly billing. You pay for the usage, as you decide. You would need to pre-purchase credits by subscribing to any of our plans, and refill your account in order to be able to continue using Outfy's services. We do not auto-charge you anything, ever. How much will it cost me every month for using Outfy? As much as you want to spend! What is a Free plan? When you create an Outfy account, we automatically set you up with a no-cost Forever introductory Free Plan. In this free plan, your account is reset to 30 credits every month. You can use those credits to share your products/promotions on your social networks without paying us a single dime. 30 credits every month (capped to this limit). Connect any number of Social networks. Access to all other features like Collage, Video, Gifs etc. You can always upgrade to higher plans for getting access to other Social Networks or if you need more credits. How can I refill the credits? How much does each share cost? What is the validity of these credits? My products failed to publish on my chosen networks, but my credits got deducted. How do I get my credits back? I just bought a package, but my credits have not been added. What do I do? I am unable to buy additional credits. How can I continue using Outfy services? Where can I see my credit balance? Can I share Outfy credits across my multiple shops on Outfy? Well, we have so say, this is one of the most compelling feature of Outfy which every seller looks out for. If you wish to completely hand over the task of sharing/posting of your products to Outfy, Autopilot is the ONE you should definitely take advantage of. With Autopilot, you no more have to worry about sharing or scheduling your products every day. Just enable it, let us know your preferred time and number of products you wish to share everyday and Outfy will do the rest. Outfy picks up a handful of random products and schedules it for the next day. The scheduled list is prepared everyday so that your latest products stay on priority. The products are shared only on networks you choose to. Once all your products get shared at least once, they are auto rotated. Outfy plans your daily schedule in the best possible way which befits without breaking the norm of your social networks. Your old inventory gets the chance to move generating your more sales. You can always view your next day schedule via Planner. What are the different types of Autopilot/Autoposting ? Product automation - Simple autopilot task which picks up your product images and schedules them for posting on your preferred networks. The products images sent to networks in their original form without any modification. Collage automation of product - Fully enhanced version of Autopilot which combines your product images and converts them into a stunning Collage. The best matching template is intelligently picked up based on the number of your product images. In addition you have the provision to add your store logo to the collage and make it more branded and meaningful. GIF automation of product - Completely enhanced version of Autopilot which takes your product images and transforms it into a riveting animated GIF. All of your products images are rotated in sequence creating an eye pleasing experience for your users. Add your store logo to give a touch of branding. Note: Collage/GIF automation is only supported on 5 networks - Facebook, Twitter, Pinterest, Instagram and Tumblr. Outfy highly recommends you to go for Product Collage/GIF automation instead of the stale and simple product posting. Put your blog (series of blog posts) in Autopilot mode and get absolute solace from manual sharing whenever a new blog post gets added. Works similar to Product Autopilot, just enable it, let us know your preferred time, which blogs to share everyday and Outfy will do the rest. Based on your desired settings, Outfy picks up a handful of blog posts and schedules it for the next day. The scheduled list is prepared everyday so that your latest blog posts stay on priority. The blog posts are shared only on networks you choose to. Once all your blog posts get shared at least once, they can be chose to be auto rotated. Note: Blog autopilot is only supported on 5 networks - Facebook, Twitter, Pinterest, Instagram and Tumblr. How creating a promotion/sale announcement works on Outfy? Now you can create promotional content/sale announcement about your products and push them to social networks through your Outfy account itself. Its super easy and quick, all in one place! If you create the promotion/sale announcement from "Promotions" page, Outfy auto selects your product’s default image for promotion. How to make use of post Templates on Outfy? So wherever the above mentioned fields appear in your template, they’ll be replaced with the actual values of a product during sharing/posting. Additionally you can set the maximum number of hashtags to be added in a post to prevent overloading with hashtags. Every social network maintains its own template to provide you the maximum level of customization and regulation. How is it different from earlier creation of posts ? We would say, its an epic leap. Imagine, earlier you wanted to prefix this static text - ‘Authentic Handmade Stuff. Free worldwide shipping!’ in every post, the only way was to manually add it every time. How does it effect Autopilot users ? Autopilot users - please pay attention to the new template introduction. This can be quite tricky if you don’t frame up your templates properly especially for Twitter where character limit is a big constraint and text gets stripped off. Add the template fields at the beginning which are important for you. Lastly for all other social networks, you are absolutely free to customize and configure the Templates the way you want to! Share/Schedule your products on Instagram in the Safest, Easiest & Quickest way via Outfy. Connect your Instagram account (this is one time process). Use Outfy web or mobile to share/schedule your product. Open the push notification which will quickly open the native Instagram app with the product photo & caption ready. All you need to do is confirm and publish the product to your account. Login to Outfy app in the same way as on Web (Email or Facebook). Web : Navigate to Connect page. Mobile : Choose any product to share; Instagram will appear as the first option amongst others. Now choose any favorite product to share on Instagram along with other networks. Add caption or promotional text for your product. Share immediately or schedule for later. * Easily share/schedule on Instagram from web if you prefer using Outfy web/desktop. This is the last step and has to be executed manually; we understand its a pain but Instagram does not allow fully automatic sharing/posting. But we do the heavy lifting by making the product photo and caption available for you at the time of sharing. Note - You need to have Outfy and Instagram apps installed on your mobile to complete the process. A push notification will be pushed on your mobile device asking you to share the product. In case you have scheduled it, you will get a notification at the specified time. Open the push notification, Outfy app will quickly take you to the native Instagram app with photo and caption. Tap/Long press your finger in the caption box to paste your caption; we automatically copy caption for you - all you need to do is just paste. Why don't I get notifications for scheduled Instagram posts? If you are not receiving Outfy notifications on your mobile, possibly you have declined the required permission during app setup. Go to your phone's Settings. To run Outfy smoothly, we advise to grant all permissions. After doing the above steps, you should be able to receive notifications of your scheduled Instagram posts. Note: If this problem persists, please uninstall Outfy and do a clean install again and provide the necessary permission during installation process. I've lost or accidentally cleared or not received my Instagram notifications. How do i process my pending posts ? Navigate to second tab (Instagram notifications). All your pending Instagram posts are listed here. Choose any product from the list and share it on Instagram the same way as you do always. I am unable to connect my Facebook Page. Why? Open Facebook in another browser tab. Go to Business integrations page - https://www.facebook.com/settings?tab=business_tools. Search/Look out for Outfy app. In case it’s available, please remove it. Ensure to properly search it. Now completely Logout of your Facebook account. Come back to Outfy and try connecting Facebook Page again. Still no luck? Facebook connect works best on Chrome browser. If you are using IE/Safari/Mozilla, try switching to Chrome. This is just one time process and you can always go back to your Favorite browser later. Trying to connect my Pinterest account gives me a blank screen or an error message. Why? Look out for Outfy app and if you see it, click "Revoke Access"
Note: You need to perform all of the steps above in Incognito or Private mode of browser. Still no luck? Pinterest connect works best on Chrome browser. If you are using IE/Safari/Mozilla, try switching to Chrome. This is just one time process and you can always go back to your Favorite browser later. My posts are going to my Facebook page, but there is no image being displayed. What do I need to do? This distortion or missing image issue is faced mostly if you have chosen to "post as a link" for Facebook page. When you choose to "post as a link" on Facebook, the onus is on Facebook to scrape the website and pick and image for posting. Facebook sometimes misses picking the image, and the post goes out without an image. This will post the image directly from your online store to Facebook. Just ensure that you maintain a time interval of minimum 4hrs between two consecutive posts on Facebook, as this is a stipulation again by Facebook and is hard-coded in Outfy posts for your convenience and reducing all risks to violation. I want to "post as a link" only. How can I ensure that my posts are not distorted / have missing images? This will post the links from your online store to Facebook. This ensures that atleast 3 images get posted instead of one. But this works only if your store has multiple images for a single product. So, if your store doesn’t have multiple images for a product, the probability of distortion of the available image may still not be ruled out completely. What if I do not have an account on some of the social networks shown on Outfy? If you do not have an account on any of the networks, you can know more about them here and create an account on their website. Next simply share your account information to connect it with your Outfy. I log on to We Heart It using Facebook/Twitter/Google. So why doesn't Outfy allow me to use my Facebook/Twitter/Google credentials to connect to We Heart It? Facebook/Twitter/Google, for your own safety, does not allow 3rd party authorization. And hence it is essential to have an email account on We Heart It, in order to connect with Outfy. If however you don’t have an e-mail login and password for We Heart It, let us guide you through it – without altering your existing profile/account. Get instructions here. I log on to Fancy using Facebook/Twitter/Google. So why doesn't Outfy allow me to use my Facebook/Twitter/Google credentials to connect to Fancy? Facebook/Twitter/Google, for your own safety, does not allow 3rd party authorization. And hence it is essential to have an email account on Fancy, in order to connect with Outfy. If however you don’t have an e-mail login and password for Fancy, let us guide you through it – without altering your existing profile/account. Get instructions here. I do not know about many of the social networks listed on Outfy. How do I get to know more about them? Team Outfy provides a quick summary about each of the websites – who they are, what makes them special and their Alexa Rankings. You can find it all here. What are Twitter’s new rules and how will they affect my normal & autopilot postings? You won’t be able to repeat the same post in Shoutout (Collage, GIF, Video etc). Store/Product/Generic promotions have been disabled right now for Twitter because the same post tends to be repeated. Outfy will notify all users when this feature is back with all the compliant related changes. A limit of 2 hashtags per tweet has been imposed. So your Twitter posts populated via Planner or Dashboard or Autopilot will only populate 2 hashtags for each tweet. The Post Template for twitter also reflects the same limiting it to 2 only. In return this will give more priority and visibility to the actual message instead of only hashtags. Twitter has released these new guidelines to prevent people from misusing Twitter to artificially amplify a message. This change should make Twitter network a lot more useful for everyone in the long run – less spammy and fewer bots are pretty good things to work towards. So it is important for Outfy and its users to comply to the recommended rules, failing to which will result in accounts being banned or locked. Note: This ONLY affects Twitter posts, the rest of the networks will continue to work as usual. Shoutout is a simple way of sharing non-product or any generic content with your social media followers. This is a supplementary way of engaging with creative and enticing content. Share your dazzling video and awe your followers. Why are videos loaded with default background music? Can it be removed? Videos without music tend to be flat and chances are that they could go unnoticed. So it's a wise recommendation from our experts that videos work best when loaded with music as they have a tendency to attract and engage users. Yes, you are free to opt out the music from your videos. Toggle and turn OFF the Music button located on top right of Video Creation page, your videos will be created without any background music. Videos posted on Instagram are getting cropped. How do i fix it ? 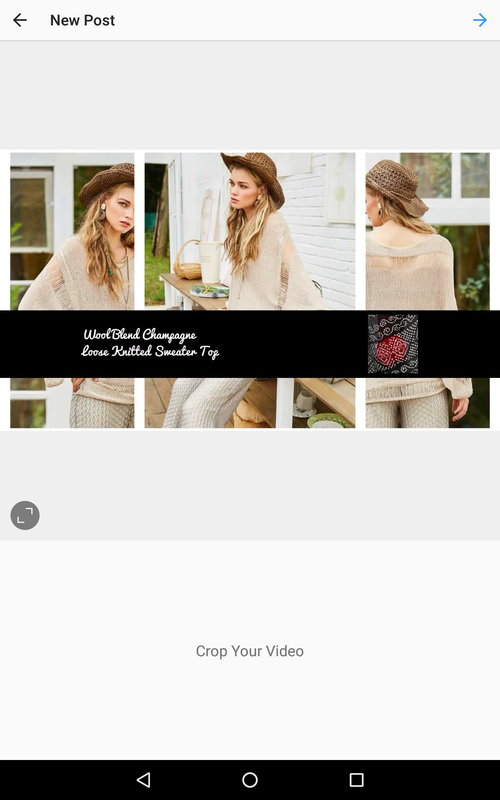 When Instagram opens up from Outfy, below is how the sharing screen looks like where Video is loaded. You will notice that video is partially cut from sides. Locate a format button (with 2 tilted arrows in a grey circle) on left hand side. Use it to change the mode from square size to Full/Original size video as shown below. Go ahead and post the video with no more cropping. What is the cost of a Shoutout? Why does a Normal Shoutout sharing cost 2 credits? Normal Shoutout sharing involves creation of a brand new custom image from your existing product images(Collage/GIF) or uploading a custom image. This image is further saved on Cloud servers for a lifetime which actually adds to our infrastructure cost. An extra credit is charged against the maintenance of this image only. Kindly note that we are charging you the extra credit only once but we actually have to bear the cost of its storage life long. In return, you get the added advantage by being able to re-share these shoutout images anytime. Why does a Video sharing cost 3 credits? Video creation on the fly is an expensive operation which involves a lot of hardware and software support. Your product images of varied dimensions are passed through our highly optimized templates and a HIGH quality video is produced out of it. Outfy team has extensively worked upon to make this process seamless and easy. Most of all, your video is saved on our Cloud servers for lifetime which adds to our monthly infrastructure cost. Please note that Outfy charges you only once but we bear the cost of it life long. Our policy has always been to keep pricing as low as possible for our users and 3 credits is the optimum we could finalize on to meet our running Video Processing and Storage expenses. Do I need to share my account details every time I share a new product? No, you only need to share your social network details once. However, if you change any account information like password/username for any of your accounts, you will need to update it to Outfy as well. Or else sharing to that particular network will fail. Why does a sharing fail for a particular website? If you have changed any of your account information on a particular network and not updated it with Outfy, the sharing will fail. Sometimes the internet gods just don’t favor us and there is a network failure. The network in question may have changed something on their site causing our system to show an error. At times, it is our own tech monkeys to blame. Though we try really hard to ensure they are fed well and share your products without any failure. What is "Import your shop" and how can I use it? Are you a store owner at Shopify, Ecwid, Bigcartel, Etsy, Storenvy, Folksy etc? Then importing and sharing all your products, one by one, to different social networks using URLs might be a bummer. So, the "Import your shop" feature lets you import all your store items to Outfy dashboard in one go. You can choose to share them all at once to different social channels or schedule them as you like. Why does Outfy charge for sharing to these websites? Outfy does not charge for sharing to social networks. We only charge you for using our easy, simple and reliable productivity tool and platform - which allows you to share to many social networks at once and helps you manage the reach of your products to potential buyers. We aim to help you in reducing the time to share on these sites individually and provide better insights on how your products have been performing on different social and social e-commerce sites. I am worried about the security of my credentials. How do you guarantee that they will be safe? We at Outfy, take security of our users very seriously. We follow International standard practices of security. All your credentials are encrypted and stored safely in our database. We do not sell or share these credentials with anyone. Also, we do not use your credentials for anything else except sharing your products that you have authorized and gathering the analytics. If I have already selected a collection or board or shelf, can I share to a different collection or board or shelf later? Yes, you can change your collection and board any time you want. Go to the Connect page, click on the edit button on a channel. Skip the authentication information. The next step allows you to change the collection or board or shelf for next set of products you want to share.